His speech keeps the listener in suspense the whole time. He starts with the financial crisis, then he stashes this theme for a moment to start a story on the American Civil war, its protagonists, its setting, stash this once again, then talk on miscalibration. Now with this topic explained, he gets back to the civil war, and then to the financial crisis. Miscalibration refers to the difference between how good you really are, and how good you think you are. (…) Miscalibration is how experts screw-up. (…) Incompetence are mistakes made by people who don’t know enough, but overconfidence are mistakes made by people who know a lot. Incompetence is the disease of idiots, overconfidence is the disease of experts. (…) Incompetence annoys me, overconfidence terrifies me. See also Malcolm Gladwell: Don’t go to Harvard, go to the Lousy Schools!, and Malcolm Gladwell on the importance of stubbornness. A very interesting speech of Malcolm Gladwell on stubbornness in below YouTube video. the mismatch problem, i.e., finding the right personnel for a task given only information on some predictors, e.g., IQ-tests, height, grades, etc. Also see Malcolm Gladwell’s article on the Flynn effect: What I.Q. doesn’t tell you about race. Average daily commuting time in Europe and the U.S.
Below chart is taken from Stress That Doesn’t Pay: The Commuting Paradox, August 2004, page 30. The data is per 2000/2001. The above document links these numbers with reported satisfaction with life — longer commuting times means less happiness. Numbers change over time. Five year later the U.S. halved their commuting time. This sparks some questions on the reliability of the data. See chart in Average Daily Commuting Time, European and North American Countries, 2005 (in minutes), data from OECD. 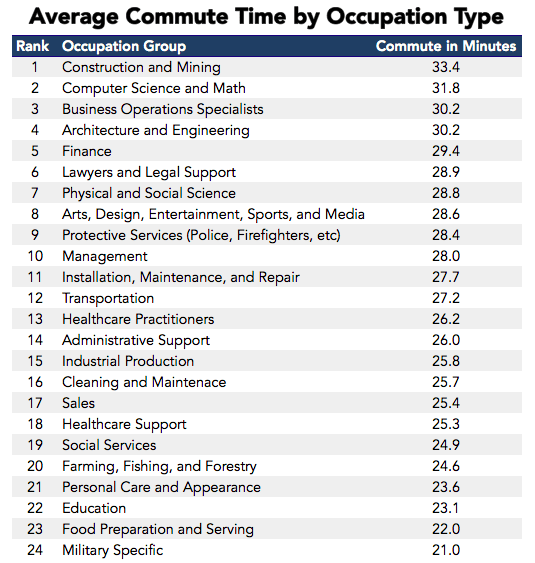 A breakdown according profession can be found in Which Professions Have the Longest Commutes?